Is social media fuelling the anti-vaccine movement? Vaccination as a public health intervention has significantly improved the health and wellbeing of the public and drastically reduced the burden of infectious diseases globally. Millions of lives have been saved with the World Health Organization (The WHO) estimating that 2–3 million lives are saved each year across the world. In general, attitudes towards vaccines are generally positive, with 9 in 10 parents agreeing that vaccines are important for their child’s health; however, the anti-vaccine movement is gaining momentum and threatens to undo substantial progress made against multiple preventable diseases. Key attitudes driving this movement include the fear of harmful side effects, a lack of confidence in the effectiveness of vaccines, and a low understanding of herd immunity. Additionally, the misconception around vaccine overload also persists. With health misinformation easily disseminated online, the ‘anti-vaxxer’ movement has now become a significant global healthcare issue. A 30% rise in measles cases across the world, with resurgences reported in parts of North America, Asia, and Africa, highlights the dangers of the anti-vaccination movement. Additionally within Europe, a concerningly low uptake of the MMR (measles, mumps and, rubella) vaccine lead to a record-breaking number of measles cases being reported last year – at 41,000 cases. The fear of harmful side effects and the lack of confidence in the effectiveness of the MMR (measles, mumps and, rubella) vaccine stemmed from a study conducted in 1998 by gastroenterologist Andrew Wakefield. His paper, which was published in the Lancet, and later retracted, claimed a link between the MMR vaccine and autism or bowel disease. This story was covered extensively by the media in 2012 and resulted in a sharp reduction in MMR uptake. Subsequent studies conducted in the last 9 years have established no such link; however, this paper by continues to dissuade families from getting their children inoculated – for those already hesitant about vaccines such publications offer validation of their fears. Furthermore, populist politicians, such as Italy’s Beppe Grillo, France’s Marine Le Pen and Donald J. Trump, have also fuelled the anti-vaccine sentiment causing significant damage to stable vaccination programmes. 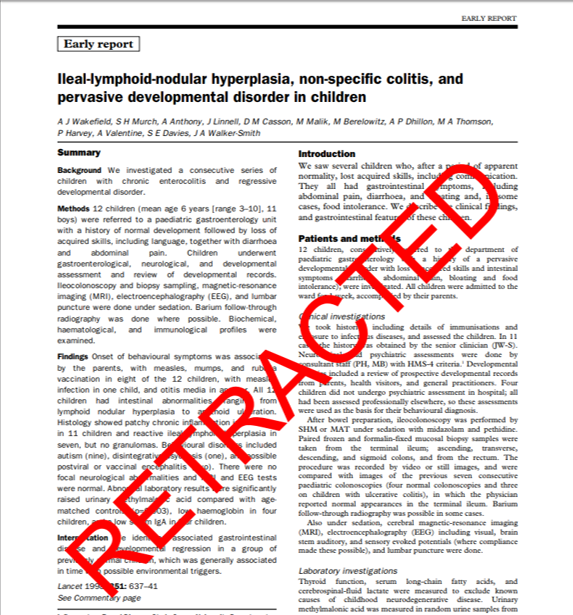 Andrew Wakefield’s retracted paper Ileal-lymphoid-nodular hyperplasia, non-specific colitis, and pervasive developmental disorder in children. Social media is a key instrument of the anti-vaccine movement. Misinformation about vaccines can now be spread faster and reach a larger demographic of people than ever before. Facebook, for example, is home to numerous anti-vaccine forums where anti-vaccine content is widely circulated. Disturbingly so, anti-vaccination groups can run targeted Facebook advertising campaigns to further spread their false narratives. In measles-stricken states across the USA, it was discovered that anti-vaccine Facebook advertisements were targeting women over the age of 25 – the demographic most likely to be mothers and have children requiring vaccination. This highlights the power of social media and how it is being increasingly used by individuals or groups to disseminate misinformation and form negative attitudes towards vaccinations. With social media playing a large part of our daily lives, it can be seen how repeated exposure to such false, unfounded or sensationalised headlines can promote the adoption of anti-vaccine behaviours. Trust in healthcare professionals remains very high, with medical professional being a trusted source of information about vaccines; however, the influence of social media on public perceptions of vaccines will continue to increase – especially in younger generations as they become parents. Vaccination is an important way of protecting the population's health; discovering ways to limit and combat misinformation online is an important step in ensuring that we do not fail to utilise them and allow a resurgence in vaccine-preventable diseases. Inklab has extensive experience in providing bespoke and synergistic medical communications solutions with the unique added extra of its own in-house digital and instructional design team. We can quickly transform complex medical and scientific content into multiple digital formats for many different target audiences. Talk to us today about how our medical writing team make your complex information easy to understand for different audiences. What makes a good medical education video? Medical writing – what is it? Bringing your science to life through expert medical communication and modern bespoke design.